The word “heard” did nothing for me. Because of that, I went to myriumwebster.com, expecting to use their word of the day. But something caught my eye. It was an article on how the dictionary needs to be constantly changed (I know I’m a nerd when things like that fascinate me). It said more than a thousand words have been added, in all categories. Sports to science. Slang to music. Some 2017 editions include urgent care, air-ball, and Epi-pen. In slang, you have whack, boo-hoo, and yowzah. I see that spell check hasn’t caught up! I wonder what people 50 years ago (heck, 10 years ago!) would have thought about not just recent dictionary additions but our language today in general. This post was another post about nothing, but what words would you add? You have undoubtedly heard that people judge you based on what you say. For me, it’s your grammar, and when typed, punctuation. An error in either is worse than nails on a chalkboard—more like knuckle cracking, which is a sound that gives me the creeps. But I would rather hear knuckle cracking 24 hours a day than things like, “Me and her are going to dinner.” Horrible. Or, “You is nice.” Awful. And my personal favorite: Misuse of the word “literal,” as in, “We literally froze.” It must be a miracle—a frozen person is talking to me right now! Personal style in clothes is one thing, but taking liberties with the English language can label people lazy, not stylish. Dead? Or Very Much Alive? I am uant-flay in ig-pay atlin-lay (I am fluent in pig Latin, for you non-speakers). I love words, as I said in my About Me page. I could literally read the thesaurus as though it was a novel and I love coming up with other ways of saying things. Hot dog becomes sweltering canine, baby carrots, infant roots. There are more, but you get the idea. If I had the chance, I would study linguistics. Everything about the English language fascinates me, from synonyms to punctuation, even grammar. Although it’s technically a dead language (another thing fascinating about language—how can an entire way of speaking just become extinct? 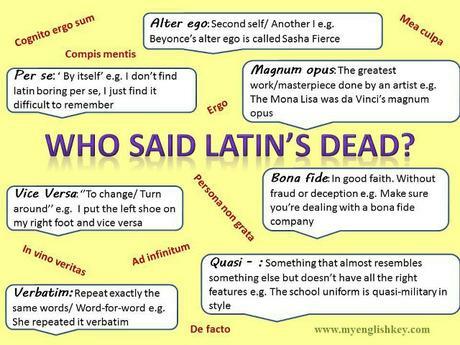 ), Latin is so interesting to me. But I suppose it’s because we are surrounded by Latin. Maggie is a canine, which is from the word “canus,” which means dog. Others include alter ego (alternative self), bona fide (genuine, sincere), circa (about), et cetera (and the rest), and alibi (elsewhere). There are many more where those came from! I guess people need to check their facts: In English alone, Latin is alive and kicking!